Amazon representatives appear to have pitched the company's facial recognition software to the U.S. Immigration and Customs Enforcement agency. Such tools have been in the spotlight amid criticism of Trump administration policies and broader concerns about privacy and the potential for government overreach. Amazon officials earlier this year pitched the company’s controversial facial recognition software to the U.S. Immigration and Customs Enforcement agency, according to documents uncovered by the Project on Government Oversight. The disclosure comes as Amazon’s product and similar tools built by other companies come under scrutiny from civil-liberties groups, legislators and even some of their own employees because of the technology’s potential for misuse. The relationship between high-tech firms and ICE has also been a flashpoint since the outcry over the agency’s enforcement of a Trump administration policy of separating migrant parents and children arriving at the U.S. border. 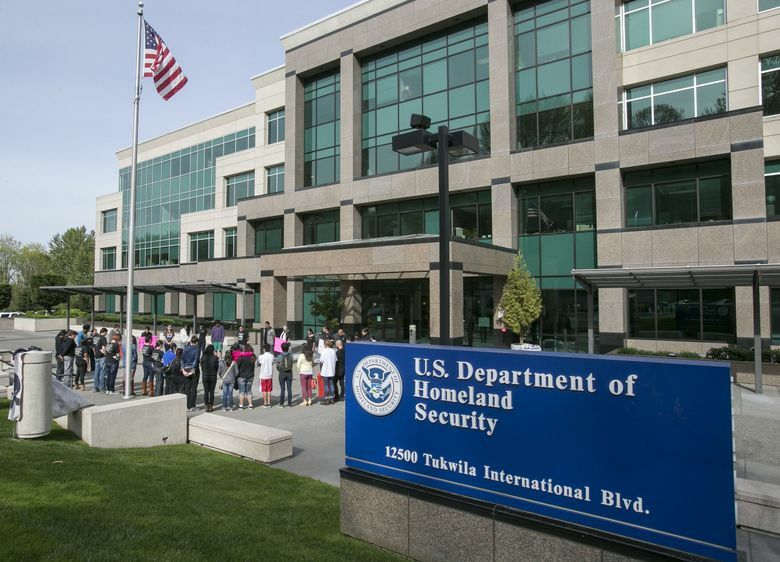 Employee groups at Microsoft, Google and Amazon have all raised concerns about their companies’ relationship with ICE or Defense Department projects. Built by the Amazon Web Services unit and first released in 2016, Rekognition uses complex algorithms to identify objects, including faces, in still images or video. The American Civil Liberties Union earlier this year highlighted the use of Amazon’s Rekognition software by a sheriff’s office in Oregon and a police department in Florida, and called on the company to stop selling the tool to government entities. The civil-liberties group later said a test it ran using Amazon’s Rekognition incorrectly identified 28 members of Congress as a match to images in a mug shot database. The Project on Government Oversight, using a Freedom of Information Act request, uncovered two new documents that show an apparent Amazon sales pitch to ICE, details of which were published by The Daily Beast. One is an email an Amazon Web Services sales employee sent to someone at ICE containing a link to an Amazon blog post questioning the ACLU’s methodology in its experiment on members of Congress and sticking up for Rekognition’s utility. The link “may be of interest given your ongoing efforts,” the sales employee wrote. The second email, also from an AWS sales employee, referred to an apparent meeting in June between AWS employees and a representative of ICE’s Homeland Security Investigations team at the Redwood City, Calif., offices of consulting giant McKinsey & Co. Included on a list of follow-up items was a bullet point about Rekognition’s capabilities. “Thanks again for your interest in AWS to support ICE and the HSI mission,” the email concluded. Amazon said Tuesday that it participated, along with other technology companies, in an event hosted by McKinsey where Rekognition was among the topics discussed. “As we usually do, we followed up with customers who were interested in learning more about how to use our services,” AWS spokesperson Nina Lindsey said in an emailed statement. ICE, she said, was one of them. Matthew Bourke, a spokesman for ICE, said in an emailed statement that the agency doesn’t have a contract to buy Amazon’s Rekognition, and declined to comment on the technology specifically. Amazon has previously said it requires Rekognition customers to comply with the law, and that there has been “no reported law enforcement abuse” of the product. Amazon CEO Jeff Bezos, interviewed at a Wired magazine event last week, echoed a point Amazon made in its earlier defense of Rekognition, saying that new technologies on their own shouldn’t be viewed as good or bad. “I feel that society develops an immune response eventually to the bad uses of new technology, but it takes time,” he said, highlighting the recent backlash over the ill effects of social-media use. He also said the company should continue to work with the Pentagon. Some employees disagree with that stance. One Amazon employee anonymously published an open letter last week criticizing Rekognition, and saying more than 450 employees had raised similar concerns in a letter delivered to Bezos. “We know from history that new and powerful surveillance tools left unchecked in the hands of the state have been used to target people who have done nothing wrong,” the employee said. Shankar Narayan, director of the Technology and Liberty Project at the ACLU of Washington, said Amazon’s pitch to ICE was disturbing.